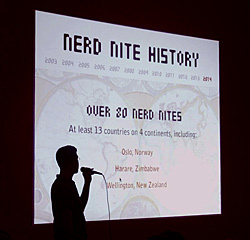 Nerd Nite is a casual yet informative slide-show presentation event, now held in over 80 locations around the globe. Think TED talks, but slightly more lowbrow, and with beer. Mo launched the Western Massachusetts iteration in the fall of 2013 and it has since ensconced itself into the local community, with large crowds often showing up on Monday nights for talks about such matters as gecko-inspired adhesives, light pollution, or the nature of reality. Mo hosted Nerd Nite monthly, including finding speakers, coordinating with venues, organizing schedules, designing fliers, writing press releases, promoting the event, doing set-up and break-down, and giving the introductory talk. He passed all duties on to new organizers when he moved to Cambridge in the fall of 2015.